The recently-appointed Archdeacon of Auckland, the Ven. 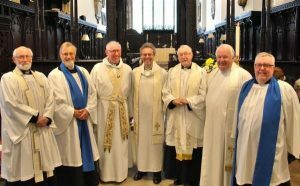 Rick Simpson, paid his first visit to St Edmund’s Church, Sedgefield, on Sunday and told representatives of all five churches in the parish of the Upper Skerne how much he was looking forward to working with them. The 51-year-old Archdeacon – who prefers to be addressed as “Rick”- is married to a GP. When appointed, he is reported as saying that he was ‘hugely excited’ because “in the Church of England as a whole and in the Diocese of Durham, this is a time of real challenge but also great opportunity”. The Archdeacon is pictured with members of the ministry team (l-r): the Revd. Martin King (former Rector of Sedgefield), Lay Reader Michael King, the Revd. Michael Thompson (Team Vicar), the Archdeacon, the Revd. Dr Mel Gray, the Revd. Malcolm Masterman, and Lay Reader Bill Armstrong. The Archdeacon preached on the theme ‘God is Love’, readings were by Ron Eyley and prayers were led by Judith King.